International Model, but fully comptable with all PS4 Games. Incredible Games. Endless Entertainment. Introducing the new, slim PlayStation 4. All new lighter slimmer PS4 1TB Hard Drive All the greatest games, TV, music and more. You’ve come to the right place. Exclusive games take you on incredible journeys, from critically acclaimed indies to award-winning AAA hits. Included in the box: PlayStation 4 System DualShock 4 Wireless Controller PlayStation Plus Trial HDMI Cable Power Cable Wired Mono Headset USB Charging Cable 3 Blu-Ray Disc Games Included: God of War, Gran Turismo Sport, Uncharted 4″Suspend mode” eliminates the load time on your saved game and allows you to immediately return to where you left off by pressing the power button. 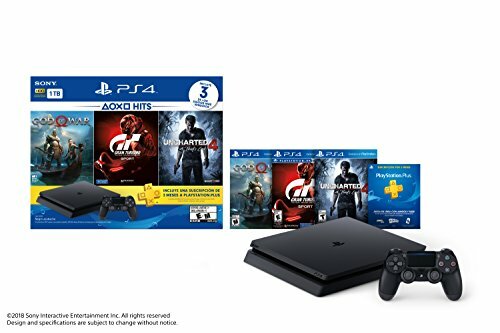 Includes 3 Blu-Ray Disc Games Included: God of War, Gran Turismo Sport, Uncharted 4. International Model.